Here's a fun card I CASE'd from someone's blog a couple months ago. I had planned it for a workshop but the hostess got sick and canceled at the last minute. Join me on one of the dates below (or both!) to create 20 Christmas cards with coordinating envelopes. The cost of the class is $30 (pre-payment required). All of the card designs can be adapted to fit your personal taste. Come enjoy some girl time, good food, and learn some new techniques! This class is a pre-order so I will need payment with your R.S.V.P. by Friday, October 3. I hope you can join me! One more thing…next Monday, September 29 is the deadline for the Halloween Treats Class. Also, I still have 2 openings for the September ribbon share. Join me on Sunday, October 12 from 1:30-3:30 p.m. for a Halloween Treats Class. We will be making the projects pictured below. You will walk away with these 5 treats including the candy and an instruction sheet for reproducing them at home. The cost is only $15 (pre-payment required). Even if you're not a big Halloween fan, you will learn lots of cute ideas that you can use throughout the year. Any of these ideas would be great for your child's class or for your friends and co-workers. This class is a pre-order so I will need payment with your R.S.V.P. by Monday, September 29. I hope you can join me! Today I started working on ideas for what we will make at my Halloween workshop. (I will post details about it in the next few days.) Here is one idea using the Stampin' Up! exclusive Baskets and Blooms Bigz XL die. These are SO easy and would be a great project for anyone! Here were are almost at the beginning of September and I have already been thinking about Christmas cards! J I am offering two separate Christmas card classes. The first one is in September. I just LOVE the new Simply Sent Card Elements that Stampin’ Up! 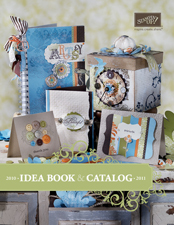 is offering in the new Fall-Winter 2008 Idea Book & Catalog (page 177). I finally had a free moment this morning to put together the cards. They were SO easy and yet so beautiful. Join me on one of the dates below (or both!) to create 18 Christmas cards using the Handmade Holiday Card Elements and the To You and Yours stamp set. You will receive one card elements kit, approximately 72 Stampin’ Dimensionals, and 18 Very Vanilla envelopes to complete your fabulous cards. The cost of the class is $26 (pre-payment required). This class is a pre-order so I will need payment with your R.S.V.P. by Tuesday, September 9. I hope you can join me! P.S. I still have two spots open for the August ribbon share. Read here for more details. I intended to post these yesterday after my last New Catalog Workshop but I had to race back to church and then by the time I got home and we got the kids in bed I was exhausted from the (way to exciting) weekend we had! Alex's 1st birthday party is Saturday so I spent most of the day putting things away and picking up the clutter. I figure if I do a little bit each day, I should be ready! The best part of my day was dinner and a trip to Home Depot with a dear friend of mine! 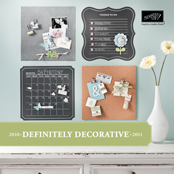 She helped me get some amazing ideas to organize my stamps, ribbon, and punches. I'll share more as we figure it out. Enough chatter! Here are the workshop cards and project from Sunday. The first card is from the Stamipin' Success (demonstrator magazine) and the other two are CASE'd from two talented ladies on SCS. Oh! The nugget box tutorial can be found here on SCS. These are AWESOME. Try it! I'd love for you to post a link to your nugget boxes. From this photo you can see a variety of patterned paper, cardstock, and ribbon choices. Then here is an example of stamping different line art images and sentiments. ...and then add the line art image and matching scallop mat. Please join me on Saturday, July 19 from 10 a.m. until noon at Sara's House! Here is your chance to stock up on all occasion greeting cards and envelopes! You will receive pre-cut materials for 20 cards and envelopes. We’ll be using the Fun and Fast Notes stamp set (see page 54) along with a variety of cardstock, patterned paper, and ribbon options. Its mix and match, Stampin’ Up-style! All you have to do is stamp your image and color it to match your paper and ribbon combination. You choose how many birthday, thinking of you, get well, etc. cards you make. You can even use the same image and different sentiments. The possibilities are truly endless! Can't attend the class but would love to have supplies to make 20 cards? Choose the "Workshop BY MAIL" and substitute your favorite stamp set. As promised, today wrapped up my final Tart & Tangy workshop so I thought you would like to see the card box and 5 cards we made. I got the ideas from various blogs and posts on SCS. Enjoy! P.S. I haven't figured out how to take a picture of everything at once so if anyone has any tips, I would be grateful!